I love the "Artist at Work" section of her website. I can't imagine how many hours she pours into her paintings, but they are gorgeous. And that snowman! His pose draws you into his story and makes you happy right along with him. Even without seeing the title, I KNEW this one's name. Let it snow indeed. Love the exuberance. 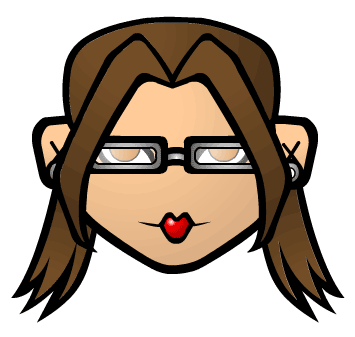 Thank you so much for your profile. I've not seen Ruth Sanderson's work. I am going to look for some of these titles when I take William to the library today. Thanks, Camille! How is it that I've never seen her books? They look wonderful. Can't wait to see that Jane Yolen Mother Goose, too. 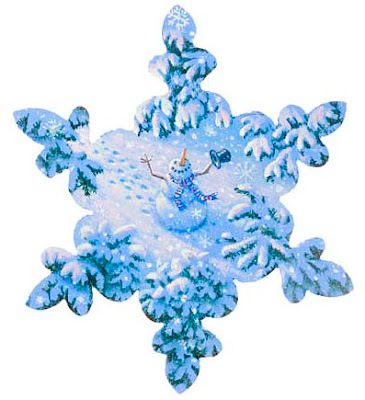 That is a really beautiful snowflake. I'm blown away by Ruth's work! I can't believe I haven't seen it before. This style is right up my alley. You sure can see how she was influenced by "The Golden Age of Illustration". That's one of the cool things about this blog event, we are introduced to so much talent. Thanks for link on how she works. Fun stuff! And Jane Yolen makes a perfect Mother Goose. So far, other than Grace Lin's, this the snowflake that I most want to own. It's so beautiful. Sanderson definitely has an elegant artistic style. I think it's perfectly suited for fairy tales. 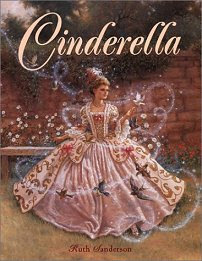 Her illustrated version of CINDERELLA was one of the most sought after in my school library. Now THAT is a SNOW flake! And, what gorgeous covers. Amazing! Beautiful! The title is perfect!